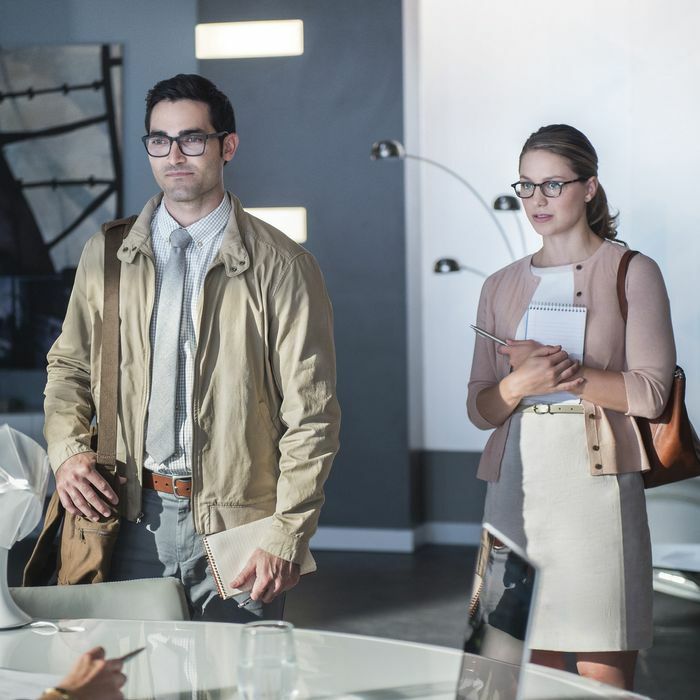 Tyler Hoechlin as Clark, Melissa Benoist as Kara. When we last left Supergirl, it was on CBS, and we had no idea if it would return for another season. The show had modest ratings but no guaranteed renewal, and as summer arrived, it didn’t seem like CBS would pick it up. It was ultimately saved by the CW, the home of a full-blown DC Comics universe built by Supergirl creators Greg Berlanti and Andrew Kreisberg. The big takeaway: The show finally found a place where it seemed to belong, even if that meant a smaller audience and (perhaps) less money. Of course, that also brings up a few questions of its own: Would the show change? Would it be brought into the CW’s “Arrowverse” so Kara could pal around with Barry Allen all the time instead of just in one wonderful episode per year? Would Supergirl still be the show it was on CBS, or would it change significantly? I’m happy to report that not a thing has changed. Season two of Supergirl makes an astonishingly seamless transition to a new network, even going so far as to pick things up just before the final scene of season one, at Team Supergirl’s celebratory dinner. If you recall, that sweet get-together was cut short by what seemed like another pod like Kara’s arriving from Krypton. In one of the few mildly frustrating decisions made in tonight’s premiere, we get a half-answer to last season’s cliffhanger — the pod is occupied by what appears to be an unconscious Kryptonian man — before this thread is completely shelved for other things. This is only mildly frustrating because all those “other things” are really great. Like Superman. You guys, Tyler Hoechlin is a really good Superman! He’s maybe a little skinny and awkward, but he is charming and just radiates the kindness and empathy that should be second nature to the character, fitting in perfectly with the ethos that Supergirl has worked very hard to build. He also manages to do this without stepping all over his cousin’s story. From the very beginning, Supergirl made the equally inspired and difficult decision to set its story in a world where Superman existed as an established hero. This meant that it had to continually justify why Superman wouldn’t show up whenever a crisis escalated to a certain level, and also that it had to work extra hard to create a show that was distinctly about Kara Danvers. It couldn’t just be a Superman story by another name. Supergirl pulled it off with aplomb, at times being a better Superman story than most actual Superman adaptations. It was a story of a woman stepping out of her famous cousin’s shadow and using their family legacy to inspire a city in a way that’s distinctly her own. This is why I’m not particularly worried about Superman overshadowing Supergirl — the show solved that problem long before the guy even appeared onscreen. Superman isn’t here to obstruct, but to illuminate — and so is the mysterious Lena Luthor, the best new thing about the premiere. Lena has relocated to National City following the imprisonment of her brother, the notorious Lex Luthor. She’s at the center of the premiere’s plot, in which the Venture — the first commercial spacecraft about to launch on its maiden voyage — is sabotaged in midair. Since the Venture was backed by Luthorcorp, Clark and Kara suspect Lena, but it turns out she was the target of would-be assassin John Corben, who was hired by a vengeful Lex Luthor to keep his sister from taking over his company and going forth with her plan to rebrand it L Corp.
Is it a ruse? Is she actually a friend? Will she become a foe? We can’t know for sure, but it’s hard not to believe her when she describes herself as “a woman trying to make a name for herself.” She’s trying to step out of the shadow of someone she shares a name with. Sound familiar? Whoever Lena decides to be, it’ll be a fascinating to compare her journey to Kara’s. Even if it ends in a tragic place. Again, Supergirl understands the secret to telling a good story about a nigh-invulnerable superhero: If you want people to care, you must zoom in on Kara’s humanity. That’s what allows the audience to feel invested in her story, and that’s what makes her narrative so dramatic. In doing so, the show also lets the people around Kara shine. People like Cat Grant. Is Cat okay? it seems like she’s hiding something. Like an illness, maybe? I’m concerned. But damn, wasn’t that diving speech good? James and Kara’s relationship is over before it even started. Part of me wishes we got to see this play out a bit more, but this move is probably for the best. John Corben is the alter ego of the supervillain Metallo. If you didn’t know him from the Superman comics, you find this out in the episode’s stinger, which finds Corben in the clutches of Cadmus — remember them? — recovering from injuries after his failed attempt to assassinate Lena, as a mysterious woman begins a procedure that will turn him into the cyborg villain. Hello there! Did I mention how glad I am to have this show back and to be writing about it again? Let’s have some fun this season.